With a coastline of more than 2500 kilometres, South Africa is home to some of the best and most stunning beaches in the world. The total coastline spans several provinces and geological regions. This means the beaches and natural surroundings are extremely varied in many ways. Tropical and exotic beaches with golden sand can be found in the eastern part of the country. The mild temperatures and warm water of the Indian ocean attract year round visitors to these stunning beaches in South Africa. The Cape province and the west coast of South Africa has very cold water from the Atlantic ocean. The pristine white beaches with soft sand are very inviting for sunbathing and endless long walks along the shore. During season it is easy to spot whales and dolphins along the coast. 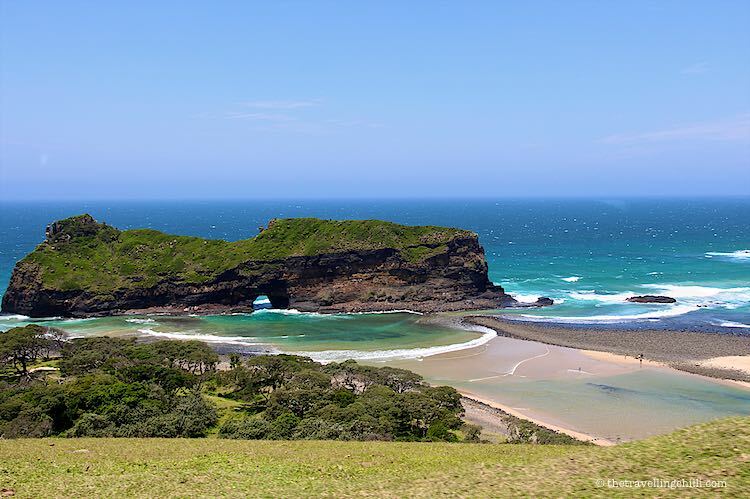 The Wild Coast and part of the Eastern Cape are home to a very dramatic and rough coastline with the most amazing beaches in the numerous bays carved out by the ocean. Blue Flag is an eco-label that is awarded to beaches, marinas and sustainable boating tourism operations. Based on certain criteria, beaches can get granted a Blue Flag accreditation. For the season 2018-2019 a total of 46 South African beaches have been awarded with the Blue Flag, of which 10 Cape Town beaches are on the list. This means that for the visitors the beaches are safe, clean and have well-managed facilities. 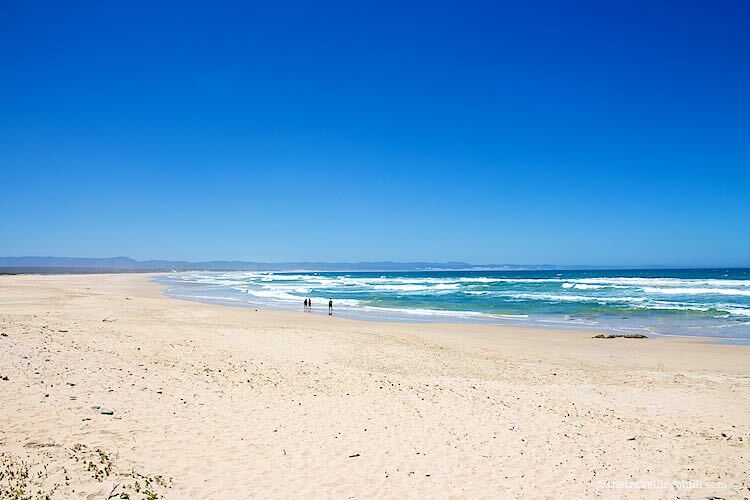 Some of the South African beaches that have we have listed have been granted a Blue Flag. In general the quality of the beaches in South Africa meet high standards, even without the Blue Flag label. Over the years we have travelled throughout the country, visiting many of the most stunning beaches in South Africa. It is not easy to select ‘only’ 20 South African beaches, since most of them are worth a visit. 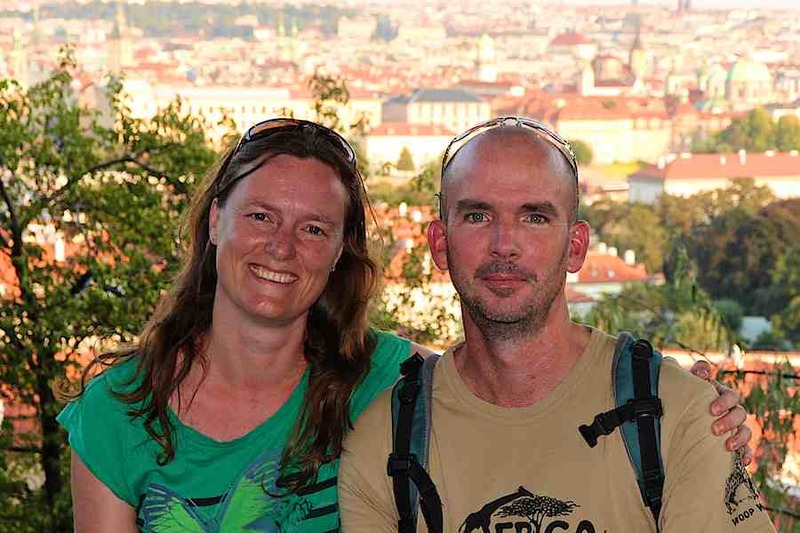 I have made a selection of beaches we have visited and that we really loved, either for the beauty of it, or because of our personal preference. The Golden Mile is the beachfront area of the city of Durban in Kwazulu Natal province, stretching all the way from Ushaka Marine World to the Suncoast Casino. Nearly 2,6 kilometres of golden sand and warm tropical waters interrupted at regular intervals with various piers. Swimming is allowed where the lifeguards are located. 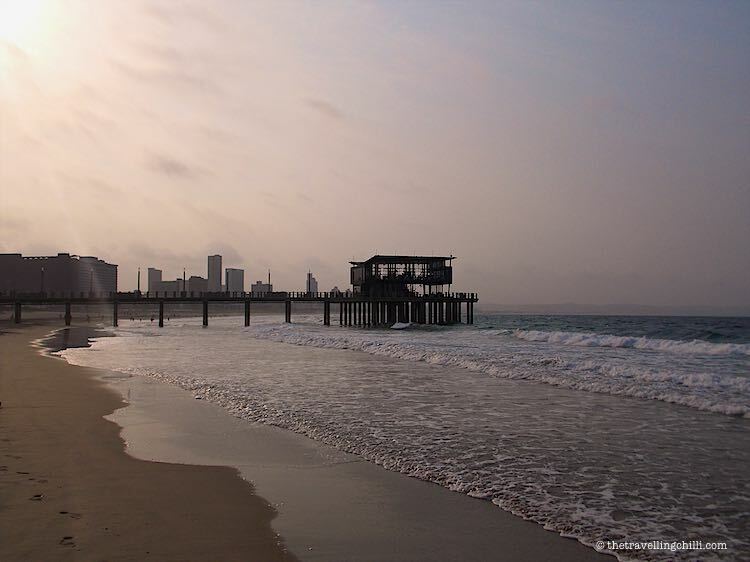 The Durban beachfront is divided into various sections with Ushaka beach being my favourite. With street performers, the nearby shopping centre, and the Ushaka Aquarium, there is always something going on, apart from sunbathing and swimming. The Moyo cocktail bar is located at the end of the Ushaka pier giving great views of the whole beachfront and the skyline of Durban. It is also the best place on the Durban beach to watch the sunrise coming up over the ocean. 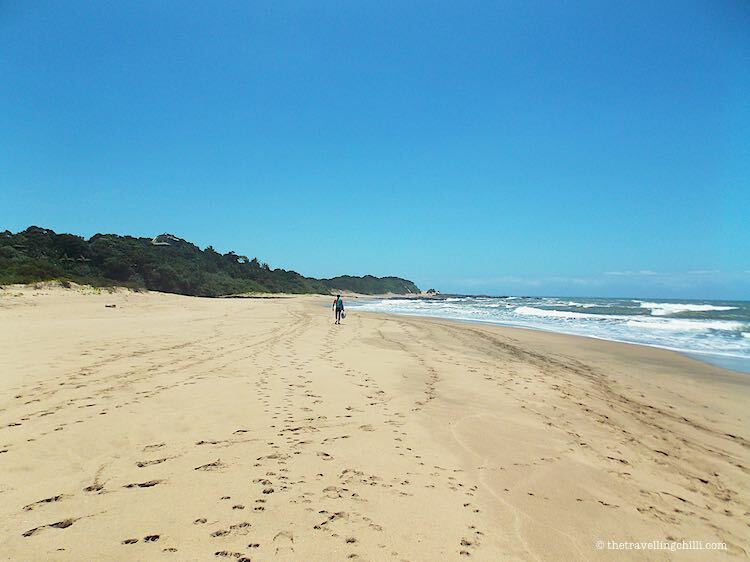 Beautiful swimming beaches, tropical and lush vegetation and a great climate makes Leisure Bay a popular holiday destination on the South Coast of Kwazulu Natal. The warm water of the Indian ocean is very inviting for swimming, snorkelling and surfing. 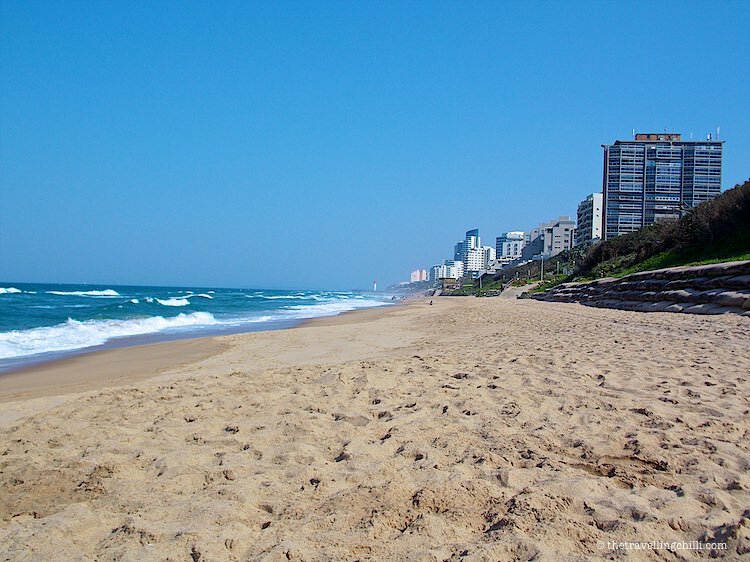 Basically there are quite a few beaches on the Durban South Coast, all long stretches of tropical beaches, some more popular than the others, for various reasons. I choose Leisure Bay, since it was a holiday favourite of Sean and his family when he was growing up. He used to spend all his childhood summer holidays on the beach of Leisure Bay with many great memories. Bloubergstrand provides one of the nicest views over the iconic Table Mountain as well as some of the most spectacular sunsets in Africa. The beach tends to get pretty windy which makes it a very popular place for kitesurfers from all over the world. 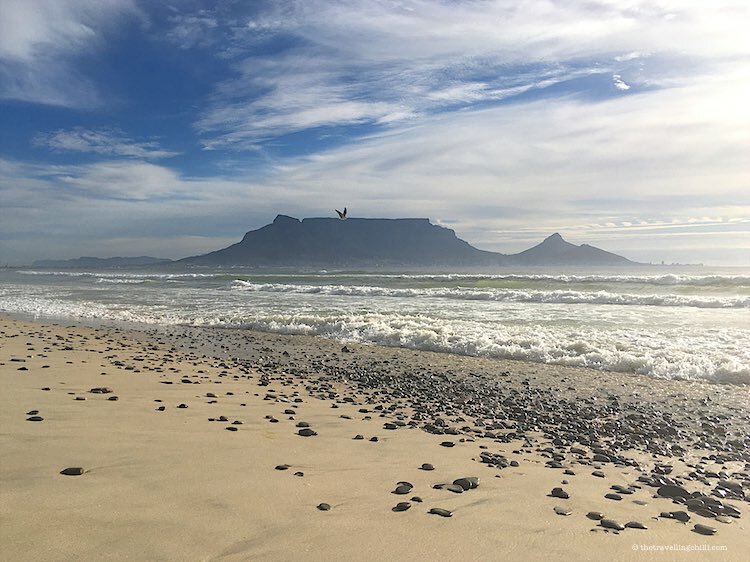 Bloubergstrand is located just 15 kilometres north of Cape Town and the name means Blue Mountain beach in Afrikaans, one of the national languages of South Africa. Noordhoek beach is an 8 kilometre stretch of unspoilt pristine white sand along the Atlantic coast. It is not that popular with sunbathers since this beach has very cold water and it catches the famous strong Cape Town winds. 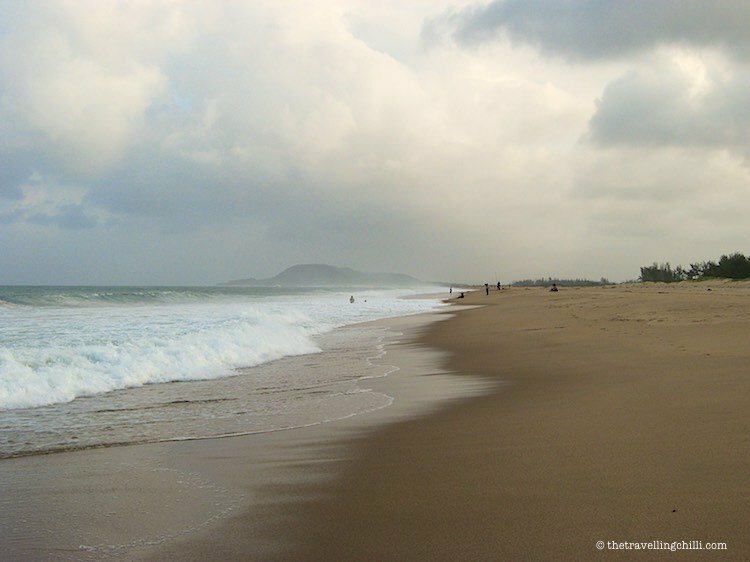 However, this untamed beautiful beach is a popular place for walking, jogging, surfing and horseriding. The beach can be reached from Cape Town via the spectacular Chapmans Peak Drive which also provides the best views of Noordhoek beach. The other side of the beach ends at the rustic seaside village of Kommetjie. 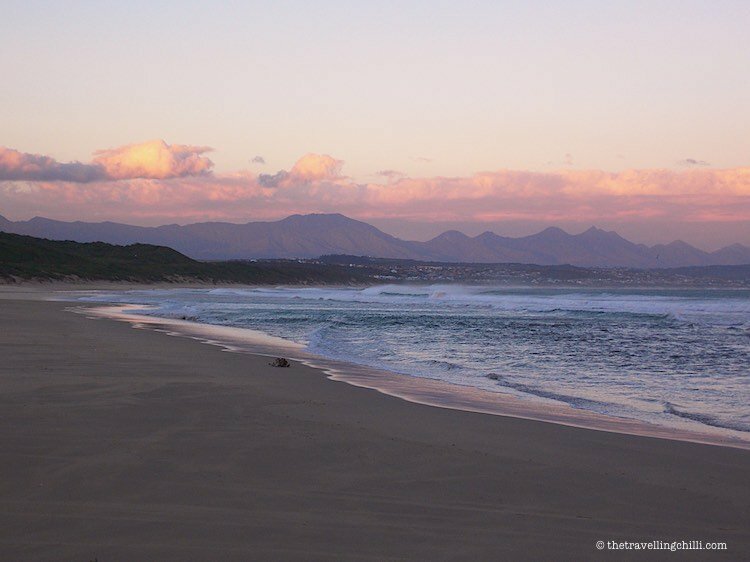 Mossel Bay hosts various popular beaches like Diaz beach, Glentana beach and Klein Brak beach. We visited Hartenbos beach just outside Mosselbay and really loved it. It has nice white sand with beautiful views of the surrounding mountains. 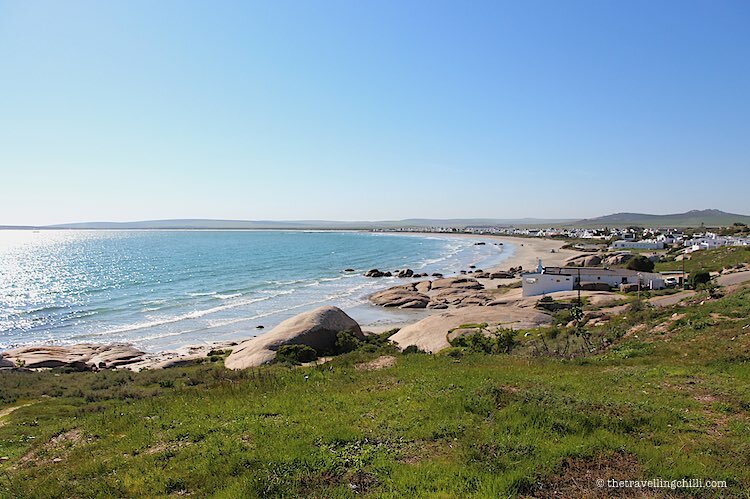 Paternoster is a small picturesque seaside town on the west coast of South Africa. The village attracts a lot of local visitors, especially during the summer and wildflower season, when the whole area turns into a carpet of spectacular colours. Many people are attracted by the white houses of the Cape Dutch architecture, great seafood and of course the long stretch of white sandy beach. It is perfect for a weekend getaway, to observe the marine bird life and to enjoy some tranquil, peaceful beach time. Most people visiting the Cape Peninsula will head straight for the lighthouse at Cape Point and the Cape of Good Hope. 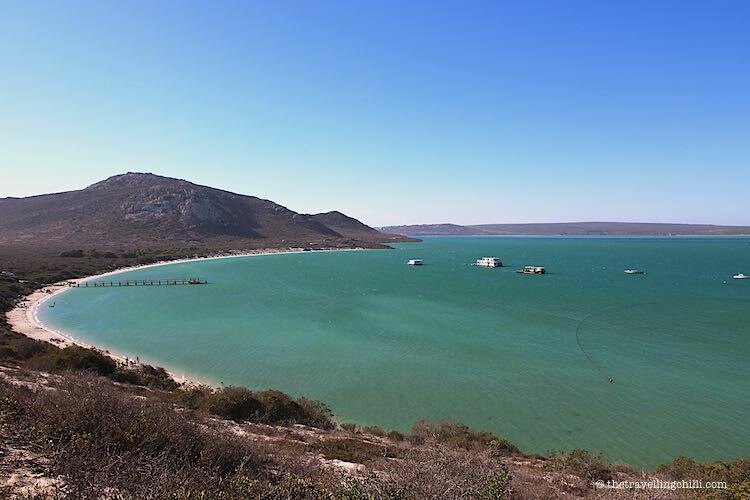 The peninsula is actually a very beautiful national park, with lots of wildlife and beautiful nature and scenery. There are also some very pristine and deserted beaches to be discovered in the natural reserve. Platboom beach has soft white sand, some great and unique scenery and most of all, hardly any visitors. When we were there, we had the whole beach to ourselves while the coaches and tourists were queuing just a little bit further on up the peninsula. Here is where one can truly enjoy the Cape Point and the most South western tip of Africa. 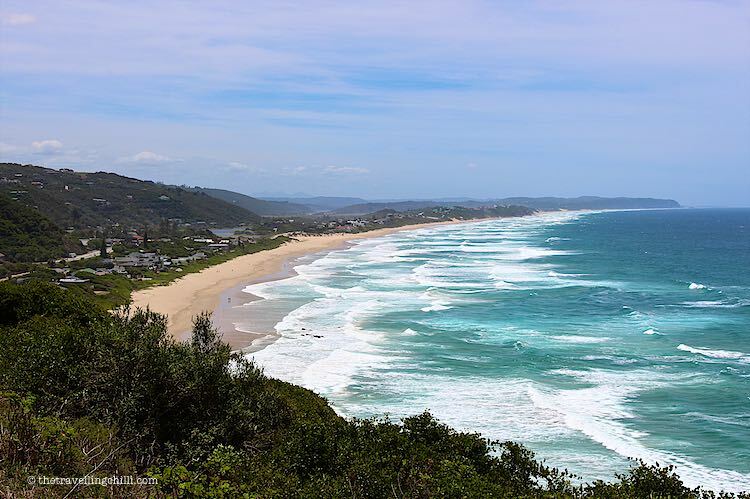 Sedgefield, located in the heart of the Garden Route, has five stunning beaches that run into one another along the coastline. Protected by the dunes, the beaches attract lots of families for some sunbathing and swimming. There are demarcated areas that are guarded and safe for swimming. Namaqua National Park is best known for its wildflowers and therefore most visited during the wildflower season. These flowers turn the whole area into a carpet of the most amazing colours. The coastal area of the park is home to some amazingly pristine beaches. Mostly of these beaches are visited by travellers staying overnight in the various campsites along the coast. Most of these camps only have 2 to maximum 6 stands so visitors are few. Most of the times you will have these white pristine beaches all to yourself. 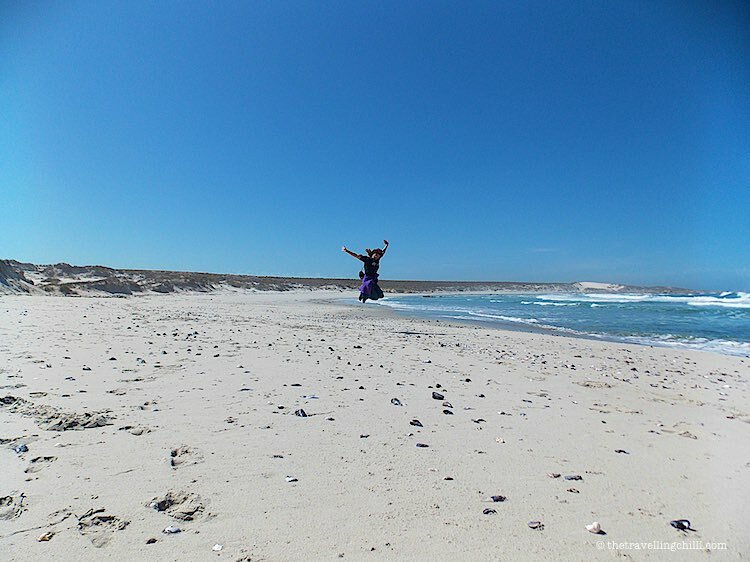 It is just amazing to discover the Namaqua coastline on a deserted beach, amidst a wide variety marine birdlife. 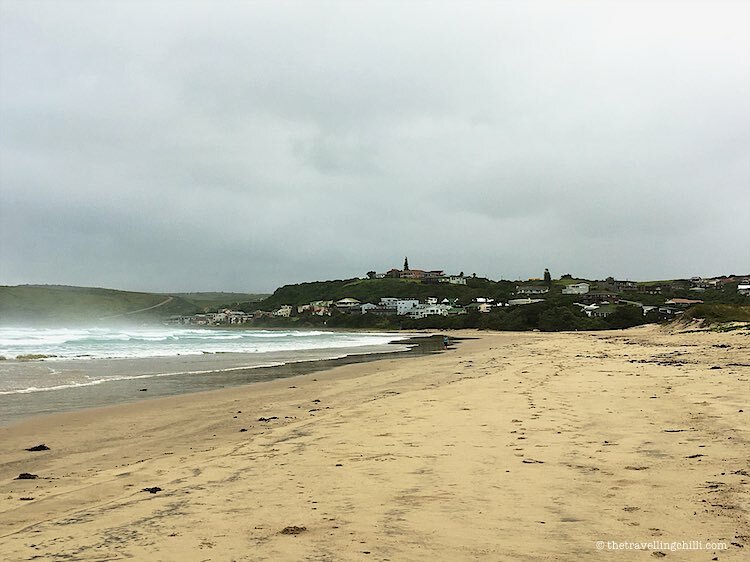 Morgan Bay is a quiet and charming seaside town that we discovered when driving through the Wild Coast on our way to the Garden Route. It has beautiful surroundings, a nice lagoon with lots of bird life and a seemingly endless stretch of golden beach. Tip: The beach is located on the tip of the West Coast National Park, take some time to enjoy the bird life or the wild flowers during season. A small entry fee is to be paid for accessing the park. Muizenberg, a seaside suburb of Cape Town, has possibly one of the most photographed beaches in South Africa. It is home to beautiful Victorian beach houses, lined up in all the colours of the rainbow. Muizenberg has a very active surfing community making it a very popular and vibrant beach attracting many visitors from Cape Town. The water is also significantly warmer on this side of the peninsular, so swimming in the water here won’t send you into hypothermic shock. Wilderness beach is situated in the heart of the Garden Route. A beautiful vast stretch of beach with soft and clean sand making it a great beach for long walks or swimming in the refreshing water. The best view of the beach you get is from the parking lot on the N2 at the mouth of the Kaaiman river. A visit to Wilderness should definitely be on your Garden Route itinerary. St. Lucia forms part of the iSimangaliso Wetland Park. It is around 240 kilometres north of Durban and is located along the Indian ocean. The pleasant climate and the warm tropical water of the Indian ocean attract many national and international visitors year round to enjoy all the area has to offer. St. Lucia has some very nice unspoilt beaches backed by sandy dunes stretching as far as the eye can see. 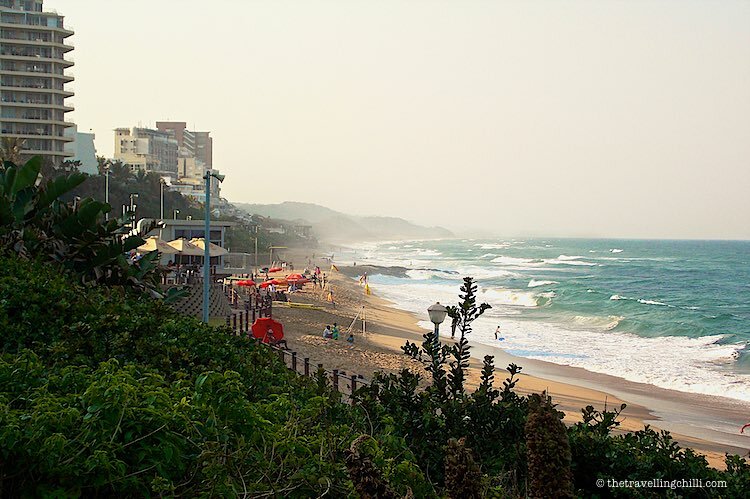 Located just north of the city of Durban, Umhlanga is a popular holiday destination for locals as well as international tourists. Swimming is possible all year round due to the warm water of the Indian ocean as well as the pleasant tropical climate of the area. The golden sandy beach is very inviting and swimming is possible in demarcated areas with lifeguards. A paved walkway passes along the beach making it an enjoyable walk for anyone who wants to be close to the sea but not walk on the sand. 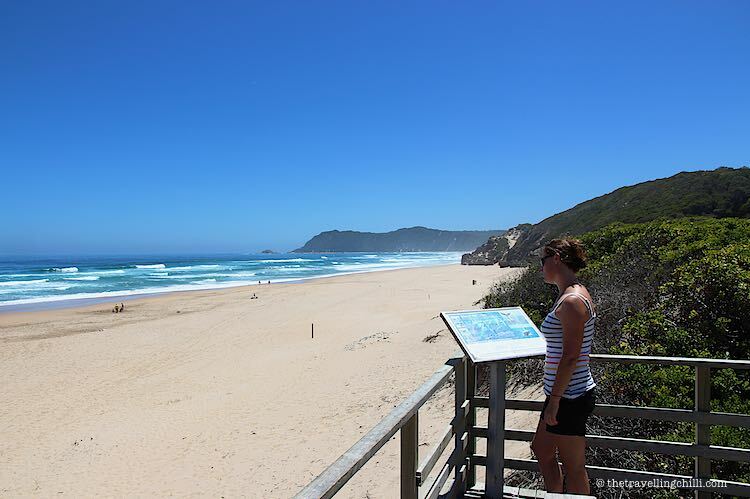 The Wild Coast offers some of the most unspoilt and best beaches in South Africa. 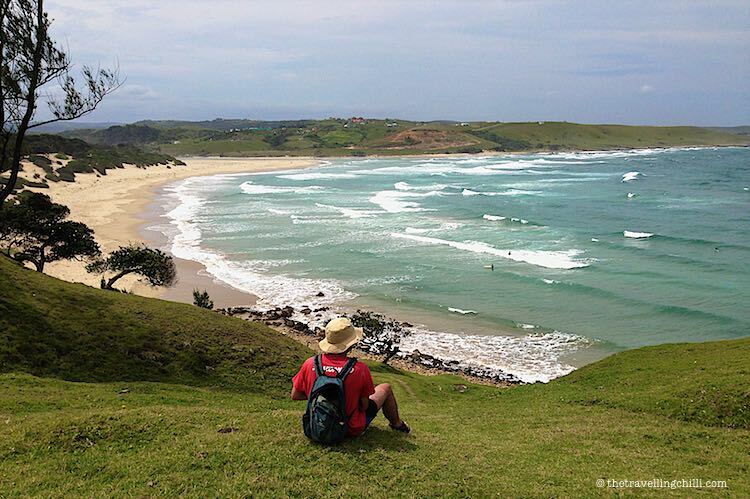 Along the entire coastline of the Transkei, one can find the most beautiful and isolated beaches where you will see hardly any other visitors. One of the slightly more visited places on the Wild Coast is Coffee Bay and the spectacular ‘hole in the wall’, a rock formation of a natural arch caused by wave erosion on a tidal island. The nearby beach has an amazing view of this massive landmark. It’s a great place to cool down and relax after visiting the rock formation. Jeffrey’s Bay, locally best known as JBay, is one of the top surf meccas of the world. The seaside town has been attracting surfers from around the globe for many years. The waves in JBay have been regarded as some of the best in the world. So if you love surfing or just like to see another great endless clean beach with white sand, Jeffrey’s Bay is the place to be. Clifton beach, one of the more popular beaches in Cape Town, is divided into four parts. They are conveniently known as Clifton 1, Clifton 2,…Clifton 4. Easy? You can reach the beach by walking down the pedestrian stairs from the main road. 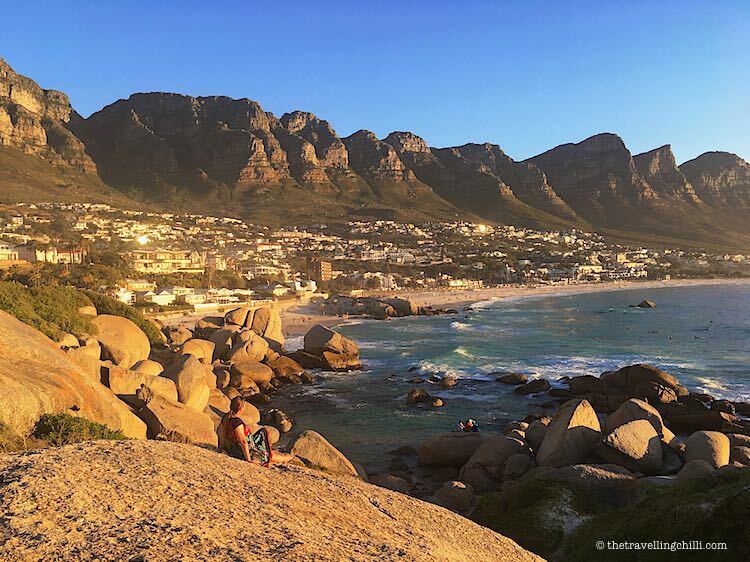 The 4 beaches are divided by massive granite boulders, giving their visitors much needed shade and shelter from the infamous Cape Town winds during the hot summer months. You will see some of the most spectacular ocean sunsets in South Africa. Unfortunately though, the water here is quite chilly, all year round. It comes fresh from the Antarctic, which is not that far way. We discovered Mdumbi beach last year while road tripping along the Wild Coast. It is one of the lesser known beaches of that region, compared to the more popular Coffee Bay which is better known to international travellers. We heard it was one of the nicest beaches in South Africa, so we had to make a stop to see for ourselves, and now we think it is too. For us it is one of the best South African beaches we visited. We stayed for almost an entire week. It is a very popular place for surfers who are the most frequent visitors. We don’t surf, but we had a great time walking on the beach and swimming in the warm water. On top of that, during season, you can have some of the best and freshest seafood, such as oysters, caught by the locals. With the backdrop of The 12 Apostles, Camps Bay beach is definitely one of the beaches with some of the most spectacular scenery and one of the best Cape Town beaches. With palm trees, pristine white sand and turquoise blue water, this beach is mainly used for sunbathing. As with Clifton, the ocean in this part of South Africa is freezing and you will not find many people swimming, not even on a hot summers day. What makes Camps Bay so popular is the location and the many fancy bars and restaurants lined up along the beach, where you can sip a cocktail while admiring the famous golden African sunset over the Atlantic ocean. Call it The Beverly Hills of South Africa, a place to see, and be seen. What is your favourite beach in South Africa and why? All the beaches look fabulous guys. I would tend toward the Eastern side beaches. Love warm waters, tropical beaches and any beach I have enjoyed on the Indian Ocean has been first rate. I also figure those waters may be a little less sharky than the colder waters on the Atlantic side, with all those Great White Beasts! Thanks a lot. The Indian ocean beaches are so nice. There are sharks but there are shark nets in the ocean to keep them away from the shore. Those areas are indicated so if you swim there, it should not be a problem. I have yet to make my way to South Africa and I know that beaches will be very high on my list of things to do! Muizenberg bach in particular looks so pretty and colourful with all the Victorian beach houses! Saving this for when I go there! Suddenly I feel homesick! What a lovely post. I really enjoyed reading it. I have been to almost all the beaches and I can’t decide which is my favourite. I love Camps Bay, but not the beach so much. The vibe is stunning, especially when you are having a cocktail, watching a summer sunset. I hope to get to SA next month – fingers crossed. I’ll keep my fingers crossed. And true what you say about Camps Bay, it’s the entire setting of the place, with the backdrop of Lions’ Head and the 12 Apostles with the sunset views, then the beach itself. I am yet to go to South Africa. While we all studied about cape of good hope in school, I had no idea there are such lovely beaches close to cities like Durban or as part of national parks. Wonder what kind of wildlife it would be so close to the marine life. I am a total beach person and always google best beaches in a country when I am travelling there so this post is treasure for me! 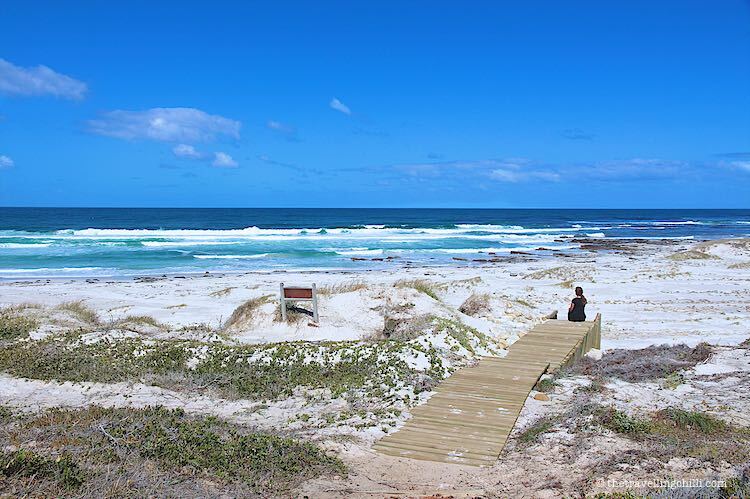 I love all the beaches you’ve listed here, especially Platboom beach in Cape Point and Wilderness Beach. What I like the most is that none of the ones you’ve suggested here seem too crowded and that’s exactly what I want when I go to a beach, the least crowd possible! 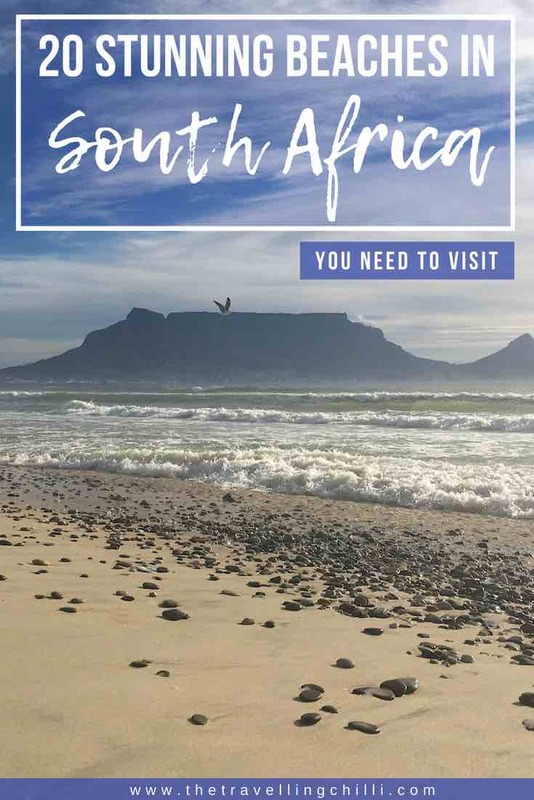 I have never been to South Africa but will probably travel there in 2019 so will bookmark your post. Thanks! In general the beaches in South Africa are never too crowded, with one exception which is during the month of December when a lot of South Africans visit the beaches during their summer holidays. For the rest, mostly you will have a lot of the beaches to yourself. So many beaches we have here with so many views to offer. I can’t seem to favorite any ’cause I love all the 20 beaches but I think I’ll go towards the side where there’s no overcrowding. I’ve seen Kraalbaai beach on social media severally, it looks familiar. I might as well go to SA for the remaining 19 beaches. You had me at Moyo cocktail bar on Ushaka pier! 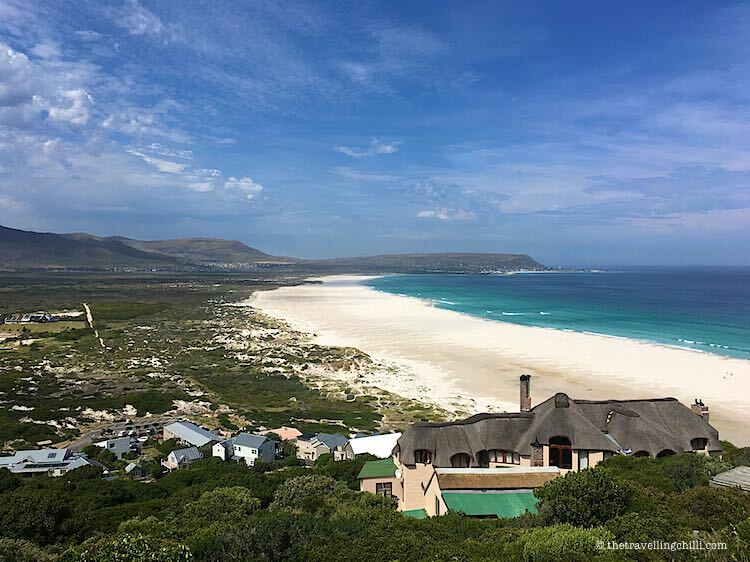 The beaches in South Africa look incredible – I love the diversity between popular sun-bathing spots like Muizenberg Beach, versus the wild windswept beaches like Noordhoek beach. I love the wild beaches, as these are the kind where I can walk my dog without worrying he’ll interrupt a picnic! Your photos are so incredible – all the beaches look so idyllic! Platboom beach looks stunning. I love the wildness of the tussocks and the waves. Even better that you had the place to yourself. The best part of travel is finding the hidden gems. You’ve just made me so much more interested in visiting South Africa. I’ve wanted to go there my entire life, as my dad is from South Africa. I hope to make it down there in the next year or so. Now I know I need to go for longer, as there are a bunch of these beaches I’d like to see. 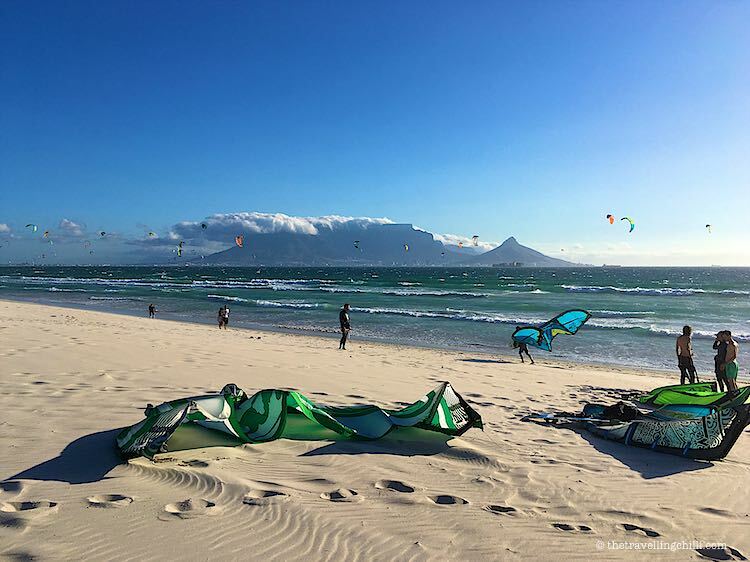 It would be fun to kitesurf at Bloubergstrand, and Coffee Bay just looks gorgeous. I also heard there is a fresh seafood buffet at one of the beaches which I’m dying to try. If you are into Kitesurfing, you’ll love South Africa. There are some great opportunities. Hope you’ll make it to South Africa soon and visit the country your dad is from. Great list of beautiful beaches in South Africa! Actually I really want to go to South Africa but my partner just got here for a month and he’s been to Muizenberg and Jeffrey’s Bay. I love all of the beaches here but If I come and visit, I’ll surely want to take an Instagram photo of Muizenberg. Those little cute beach houses are colorful! 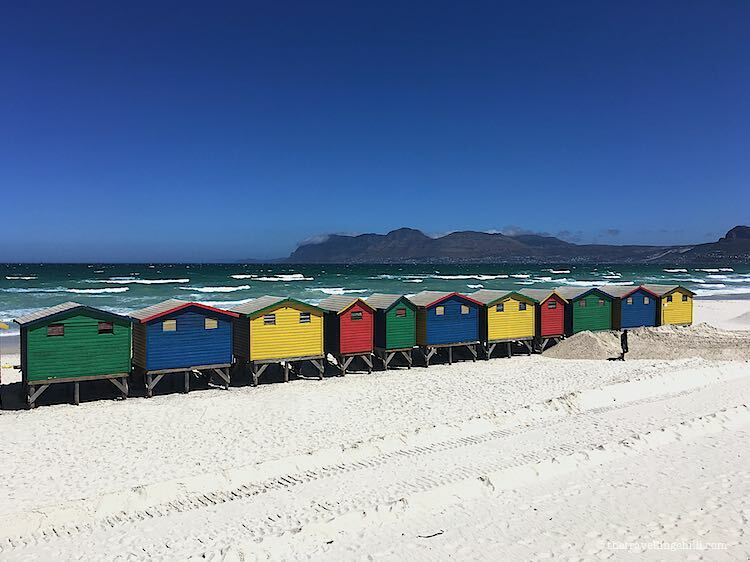 The Muizenberg beach houses are so worth visiting, they look so colourful and make a great instagram photo. All the other beaches are worth a place on Instagram as well. Great post on these beaches! I got back from South Africa in December and loved it there! I would have to say Boulders Beach is my favorite… who can resist those penguins? 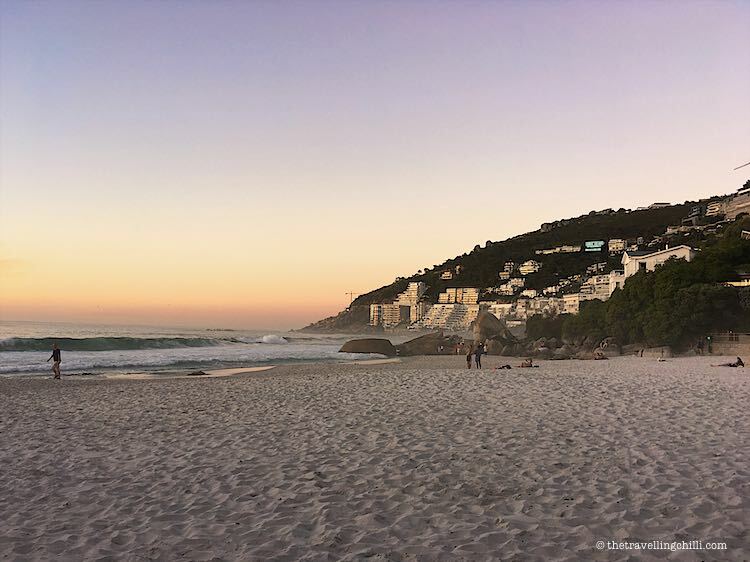 But Camps Bay is also beautiful… and so is Plettenburg… ah it is just too hard to choose! Ohh you are reading my mind with SA!! they are all gorgeous. It would be so difficult to pick I am afraid!! Wow! 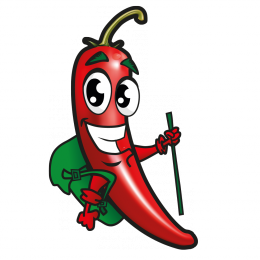 How to intrigue someone to visit SA? With these beaches! I really like Muizenberg beach because of the colourful wooden houses and Coffee bay. Would love to visit one day. Amazing list! Still need to visit some of these beaches next time I come to ZA! And lots of useful info – thanks for putting this together 🙂 ! Wow! 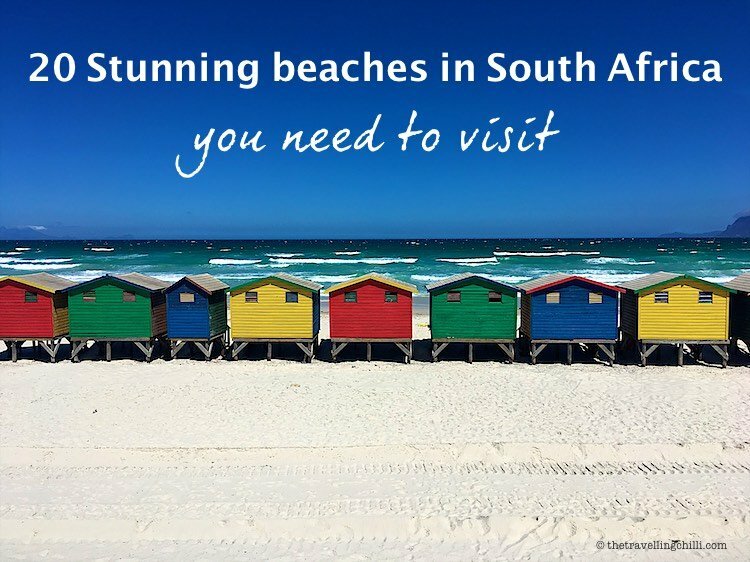 I didn’t know about most of these beaches, to be honest… I’m planning a trip to South Africa for this year, I’m definitely going to add some of these to my itinerary 🙂 Thank you so much for the info! Bakoven is indeed a stunning small beach, love it as well. And indeed, mostly you have the beach to yourself as not that many people visit. While I’m not a beach gal, you’re more likely to find me in the woods, I can truly appreciate the vast beauty of South Africa’s beaches. I had no idea they were so varied in landscape. And I’d love to see that hole in the wall, it’s mother nature at her best! I didn’t realize South Africa had so many beaches! And they are so beautiful and look like the perfect huge beaches. I didn’t realize South Africa had its own set of 12 apostles either. Definitely saving this all for a future reference.